Payback by Ramon Del Villar is a spellbinding entry in the Roberto Duran Series, a thriller that will appeal hugely to fans of legal thrillers and crime novels. Meet the fearless Houston attorney Roberto Duran, hired by Don Jose, a banking magnate, to defend a grandson caught with cocaine in the lining of his luggage at Houston’s Bush Intercontinental Airport. The grandfather believes he is innocent and Roberto is the best attorney to prove his innocence. Roberto hires a private investigator and sets out to gather the evidence that would clear the young Mexican boy, but he soon finds himself embroiled in a war he never chose and becomes a target of the Mexican cartels. Could it be there is more to this case than meets the eye. Can Roberto outwit the drug lords after him and gather the evidence he needs to defend the grandson of a Mexican banking mogul? Ramon Del Villar is a great storyteller and he begins this compelling narrative with powerful imagery. The action is intense and electrifying and it is interesting to follow the protagonist navigating very complicated and danger-ridden landscapes. The conflict is very strong and I enjoyed the way the author handles the game of power, building the tension from page to page, succeeding in holding the reader’s attention with the strong plot points and the exquisite writing. The ride is fast and the surprises are many. Payback features very powerful characters and readers will love following Roberto Duran in his world. 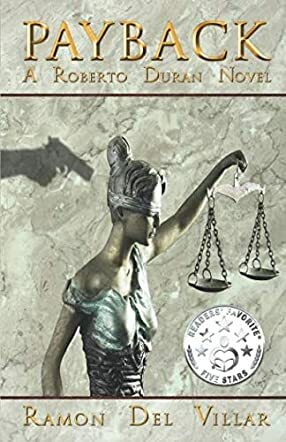 It has psychological and emotional depth and for fans of legal thrillers, it will be a great treat — awesome story line, great setting, and compelling characters.